Join Gamers for Good and help Oregon Food Bank in their mission to eliminate hunger and its root causes. Unpack and sort donated food destined for agencies that directly serve low income people in Oregon. Your presence makes a huge difference, and, it’s a lot of fun! Please wear closed-toed, closed-heeled shoes, and clothing you wouldn’t mind getting just a little dirty. Please note: OFB’s highest need is often in the Perishable Repack Room, which is temperature controlled at about 50 degrees. It is possible that our volunteer group will be utilized in the Perishable Repack Room instead of the Volunteer Action Center, depending on where OFB has donations that need to be processed. It is important that everyone be very flexible, and bring an extra layer (sweatshirt) in case we are moved. Volunteers must be 6 years of age or older to attend this project; any volunteer under age 16 must attend with a parent or adult chaperone. 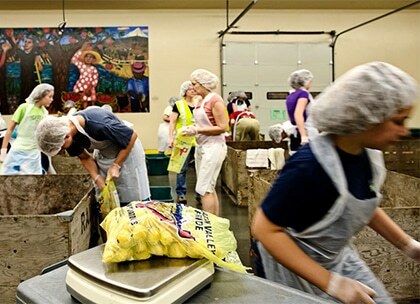 All volunteers under 18 are required to bring the Oregon Food Bank waiver signed by their parent or legal guardian.